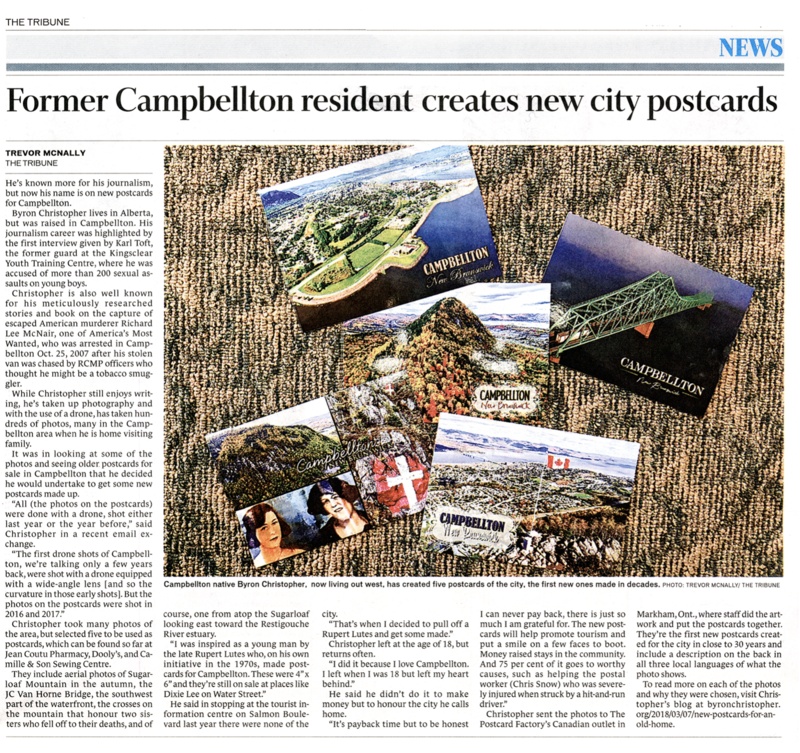 It has been decades since Campbellton had new postcards. About time, you say. The postcards came about because of two individuals: a young engineering student in China … and an aging, former resident of Campbellton who — after leaving town half a century ago — still misses the place terribly. Every story has a backstory and this one begins many years ago, in the fall of 1967. 18 years old and fresh out of high school, I was on a packed CN passenger train shunting out of town. Born and raised in Campbellton, I was hoping for a full-time radio job in my hometown. But there were none. I was working for next to nothing at CKNB Radio, The Graphic, compiling stats for the North Shore Hockey League … and public address announcing during hockey games at Memorial Gardens. “It’s good exposure,” I was assured. “I could die of exposure,” I said … and so I hit the road for a full-time radio gig in Newcastle, New Brunswick, about two hours’ away. Because of the career I chose, I saw some of Canada … then some of the world. Disc jockeys didn’t earn much [at least not at my talent level] and so I moved from one radio station to another … from Newcastle to Quebec City to a town in northern British Columbia you’ve probably never heard of. Living abroad was truly an education, an eye-opener. For three years I made Australia and Finland my home, proudly showing the locals photos of where I was from in Canada — especially those shot from 1,000-foot high Sugarloaf Mountain. The panoramic view impressed the hell out of people. I was trying to keep things positive and maintain world peace. It’s an odd thing, but it never dawned on me that my birthplace was exceptionally beautiful. I’d taken it for granted. To my way of thinking, Campbellton was a Norman Rockwell community. When I lived there in the 1950s and 60s, the world seemed to make more sense. I was just a kid but the sense I got was that people looked out for each other. They were good to me and my family … and I never forgot that. I’m talking about neighbours, teachers, classmates, and teammates. Others have had experiences that weren’t as positive, I recognize that. But I’m telling you mine. Campbellton [with a current population of 7500 or so] is surrounded on one side by the wide and peaceful Restigouche River; on the other, by the rolling Appalachian Mountains. If you are fortunate to make it to the summit of Sugarloaf Mountain, on the southern edge of the city, you’ll be treated to a stunning vista you’d normally expect to see, well, on a postcard. This is where ‘picturesque’ reads so well in the tourism brochures. While ‘away,’ I sometimes stayed in communities that when it came to natural beauty could not hold a candle to Campbellton. Not even close. They had taller buildings, yes. Subways, yes. Big shopping centers with escalators, yes. Better prices, yes. Not as much snow, yup. But few places could match the beautiful setting of a special community in northern New Brunswick, especially in the fall. No offense Mississauga, Brampton, Fort McMurray. Just hearing those wow’s left me feeling very proud of the place I came from. I’m sure many people from northern New Brunswick feel the same way. The snow swirled wildly as I flung open the door of the Tourist Information Centre down by the river. I stamped my boots on the mat, snow flying everywhere, and walked over to a rack of glossy postcards. The cards were modern and professionally done … by The Postcard Factory of Markham, Ontario. Unfortunately, they were generic … depicting New Brunswick but not Campbellton. That made no sense at all. Given the phenomenal beauty of the region, it struck me as rather odd that in a tourist centre in Campbellton there would be no postcards about Campbellton. I made a quiet vow to produce new, local postcards. 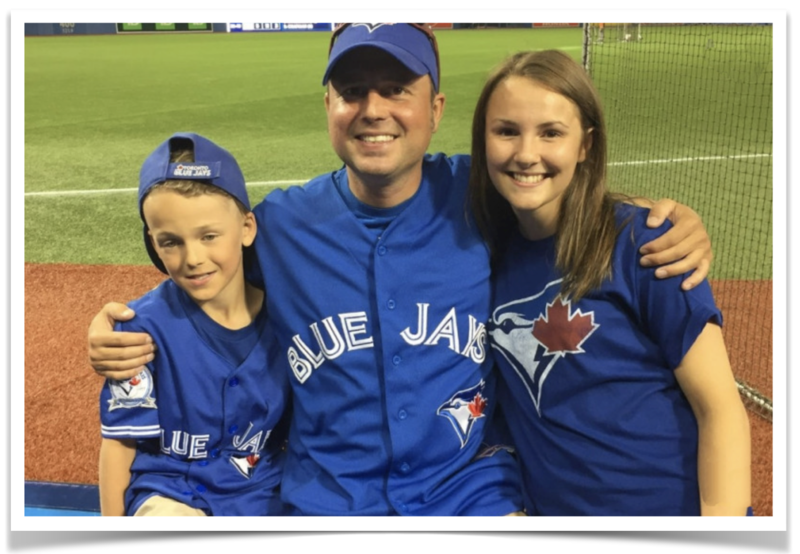 What does a whiz kid in China have to do with new postcards in Canada? Good question. Wang Tao, born in 1980, invented the Phantom, a fairly inexpensive drone that within just a few years would revolutionize aerial photography. Tao — now Asia’s youngest tech billionaire — has sold millions of these remarkable machines. 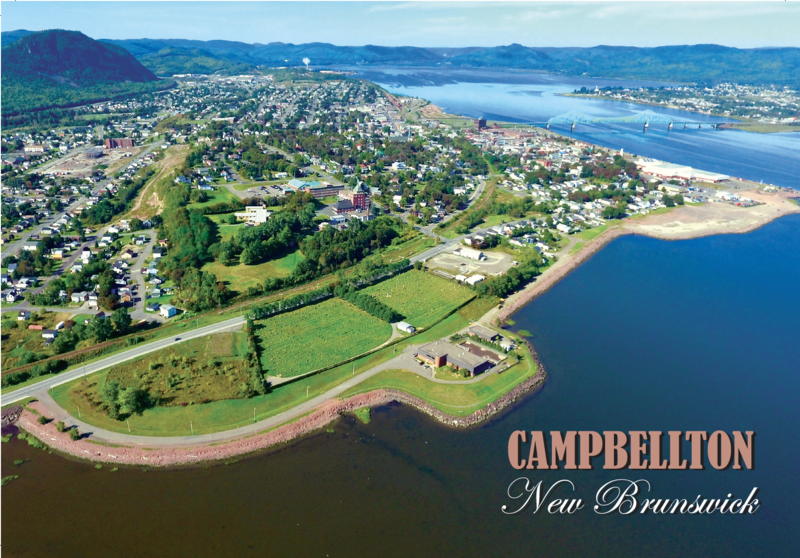 It was the Phantom 4 Pro that captured the images on Campbellton’s new postcards. The ‘entry-level’ drone sells for just over two grand. Google it for pricing information. I’ve always had a thing for postcards. Some of the cards I mail to friends and relatives but most are safely tucked away in a filing cabinet in my office. They’re among my most treasured [and least expensive] souvenirs. Another thing. Whenever I’m in a different town, I head straight to a postcard rack … to check out angles for photos. Camera-toting tourists take note. The J.C. VAN HORNE BRIDGE, built in 1961, connects Campbellton with Listuguj and Pointe-à-la-Croix, Quebec. Some jokingly refer to it as the bridge to cheap beer …. but for me, it’s been Campbellton’s number-one landmark for more than half a century. The locals are very proud of their bridge. So am I. 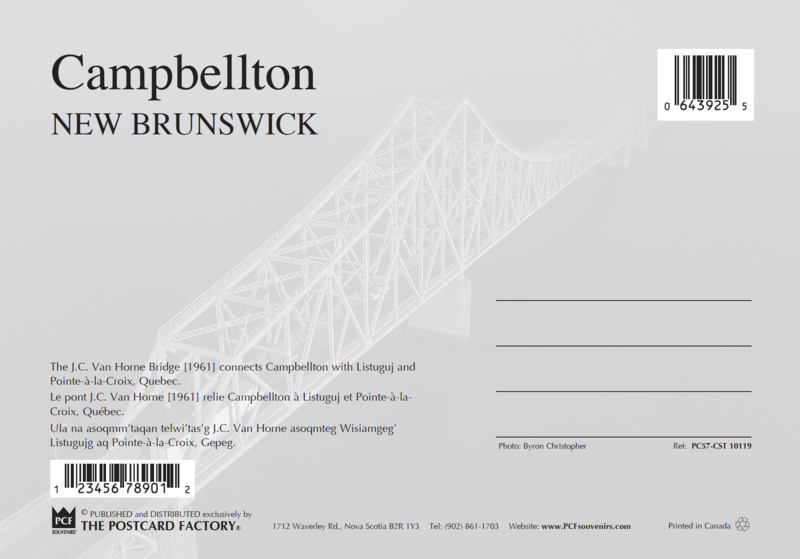 The bridge salutes Campbellton’s best-known citizen, politician Charles Van Horne. Van Horne was a visionary. The man thought outside the box and, more important, he was a doer. Charlie got things done. When I was a kid, I drove my bike across that bridge. Many times. It was exciting to be high up, looking down at the water. ‘A bridge to nowhere,’ is how a friend in Edmonton described the photo of a bridge mysteriously disappearing into the fog. To get that image, I lifted the drone from the north parking lot of the Quality Hotel and Conference Centre and quickly clicked away before the rising sun burned off the fog. One of the first to receive the postcard was Edward ‘Ted’ Skoczen, the Saskatchewan-born engineer who built that wonderful bridge. Ted was the project manager. Skoczen lived in Campbellton while the bridge was being made. He not only fell in love with the town but with a local beauty … Henriette [‘Hank’] Pitre. Hank and Ted tied the knot on January 7, 1961. Skoczen would go on to build bridges in Chatham and Fredericton, New Brunswick and throughout Canada and the U.S.
Ted turned 85 in December 2017. The Skoczens now live in Oldsmar, Florida. Click on the images to enlarge ’em. The photo, taken from the summit of Sugarloaf Mountain, on the southern edge of Campbellton, shows the viewing platform, the Canada flag, city, and area. The flag is fully extended — which meant it was windy when the picture was taken. Because of the strong gusts, the drone struggled to maintain its position in the sky. I could hear the tiny motors complaining. But thanks to Mr. Tao and his computerized GPS system which locks the Phantom into more than a dozen satellites, no problem. It worked like a charm. This particular postcard will have special meaning for locals Myah Barristo, Josee Doucet and Alex Jones. Just minutes prior, the women had posed for the drone’s tiny camera. It’s a rarely-seen view of the eastern spine of the old Sugarloaf. I chose this picture for two reasons: [a] it’s unusual and [b] the colours are spectacular. It’s my favourite postcard. That’s another draw card to Eastern Canada — those stunning fall colours. Take that, California. The photo was taken in October 2017. From the Terry Fox Trail, local media guru John Van Horne and I lifted the Phantom 4 Pro through the trees and flew it to the top of the mountain, where it circled the flag and returned — flying backward. On its return flight, John checked the monitor [an iPod Mini]. “My, that’s wonderful!” he said. The photo is now on many computers as a screen saver. A local microbrewery plans to use the image on one of its craft beers. I’ll drink to that. Here’s what a pilot would see before landing a small sea-plane on the Restigouche River — a looking-west view of a community that had its beginnings more than two centuries ago, in an era of sailing ships and horse-drawn wagons. This particular photo was taken in the summer of 2016. The Phantom lifted off from the home of Hermini Thibeault [on Sunset Drive] and flew east until the city came into full view. For this flight, the issue wasn’t the wind — but time. The drone has only so many minutes of flying time and getting it out that far was ‘pushing the envelope.’ The craft is gonzo if it goes down into salt water. Kaput. Turns out, it was worth the gamble. The drone returned home safely … albeit with a ‘low battery’ warning. 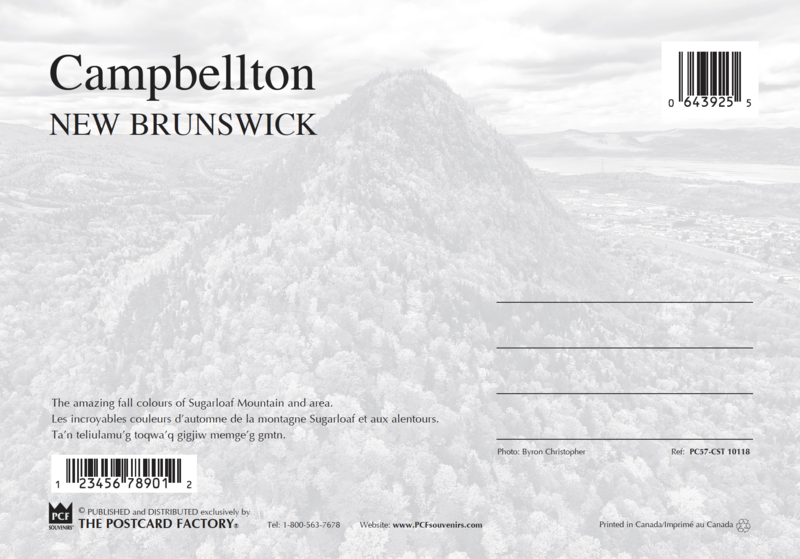 The final postcard features one of Campbellton’s best-known landmarks, a pair of crosses on Sugarloaf Mountain. The unique monument pays tribute to two sisters, Dorvil McLean and Lottie Ramsay, who plunged to their deaths in November 1924 while descending the north face of the extinct volcano. On the front of the postcard are pictures of the crosses, the jagged cliffs … and a rare image of the victims. The cards pay tribute to a stay-at-home mom and a waitress who will always be 22 and 19. 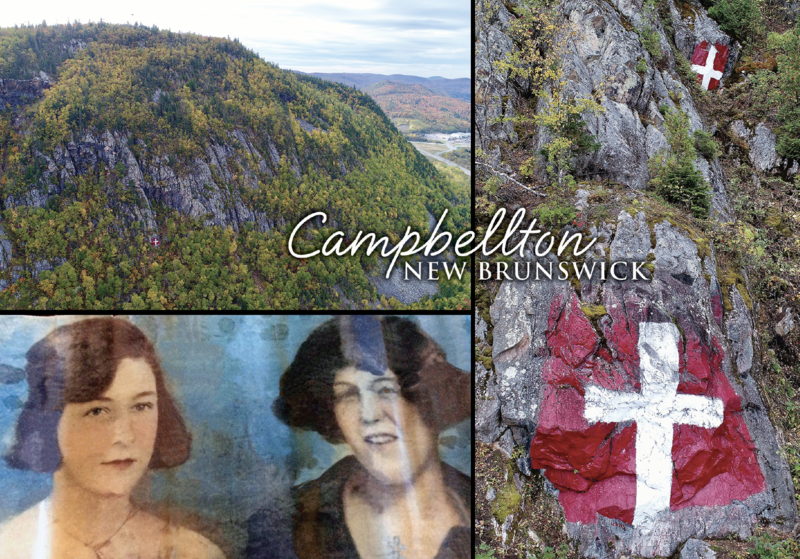 Campbelltonians know the story of the Ramsay girls, but few tourists. The postcard will help change that. The postcard was produced with the permission of the Ramsay family. It’s the only card that — owing to space restraints — does not include a write-up in Mi’Kmaq. Rose Beek was my co-pilot on a warm day in July 2017 when the Phantom climbed above the trees and, out of sight, inched toward the crosses. The red and white paint is vivid — thanks to a recent refresh paint job by volunteers, including Laura Doucet, Events Coordinator at Sugarloaf Provincial Park. WHERE ARE THE CARDS AVAILABLE? 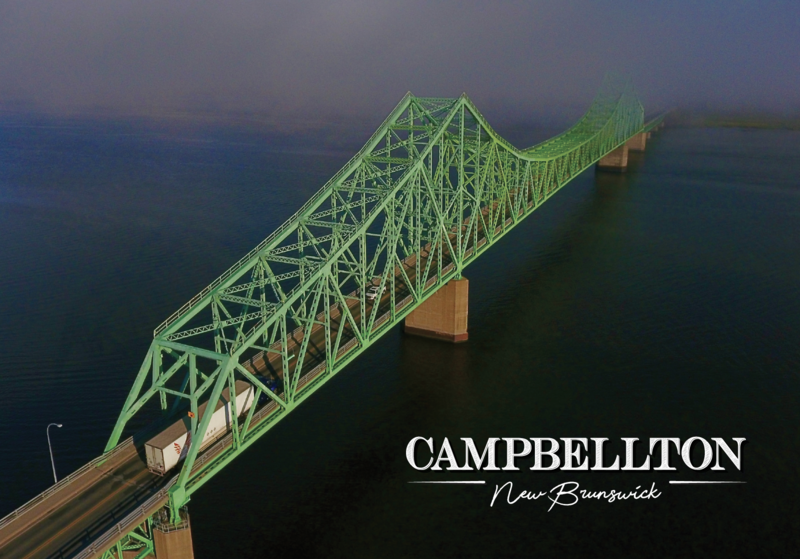 Complimentary sets of the new postcards were mailed to dozens of former Campbelltonians now living in other parts of New Brunswick, in Nova Scotia, Prince Edward Island, Quebec, Ontario, Alberta and British Columbia. As well, complimentary cards were sent to the U.S.
Postcards at the Visitor Information Centre. Most outlets are selling the cards for $1.00 each. In Alberta, postcards made by the same company sell for $1.50. You don’t want to know what they go for in the Rockies. 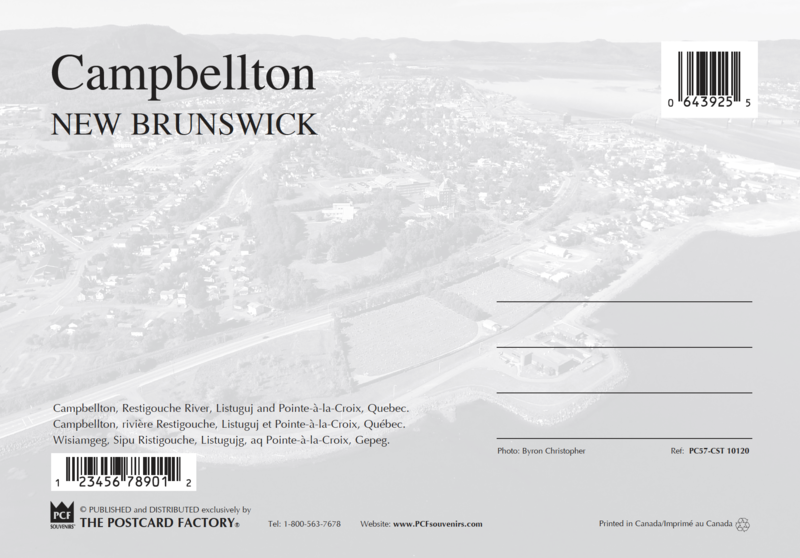 The postcards were made available to the City of Campbellton for distribution to three key outlets: City Hall at 76 Water Street, the Visitor Information Centre on Salmon Boulevard, and the new Restigouche River Experience Centre, just west of the bridge. Visitors frequent these places, so it’s a perfect fit. A question I’m often asked is … are the new postcards available online? Not yet. It depends on the vendor if the cards will be available online. I can’t speak for all the outlets in town, but I’m told that the number-one place for local souvenirs — the Tourist Information Centre — isn’t set up to sell products online. Tell you what: if you live out of town and want to buy some of the new postcards, call my cell at 780.716.4693. I’ll get the cards out to you pronto; they’ll be in the mail either that day or the following day. Note that I live in Edmonton, Alberta. Emailing works too: byronchristopher@shaw.ca. Subject heading: Postcards. There’s a charge for the postcards and postage. I will let you know what that is when we connect. I’ll forward the proceeds [minus postage] to a worthy cause in Campbellton. Proceeds from the sale of all postcards will go to a worthy cause … this can be a registered charity, a festival or a special cause. The vendors will decide where the money goes … they know the community best and know who could best use a hand. If managed properly, the project should be able to generate at least $4,000. I’m suggesting vendors retain 25 cents per card to cover things like handling and sales taxes. Alain Laforest plans to give 100 percent of the proceeds to help a man whose workplace — the main post-office — is kitty-corner to his shop. He wants to help Chris Snow, a letter-carrier who was severely injured last fall when he was struck by a hit-and-run driver. The popular Canada Post worker is back in Campbellton with his wife and son after spending three months at a hospital in Moncton. Chris Snow wears a neck brace and has trouble swallowing [he must use a feeding tube] … but he’s still with us and that’s the main thing. For a while, friends and family were worried Chris might not pull through. So severe were his injuries. The young man suffered a broken neck, ruptured spleen, 11 broken ribs, broken toes and damage to his brain and lungs. It’s fair to say Chris will never be the same. The irony is that during his ten years on the job, Chris Snow delivered thousands of letters and postcards. 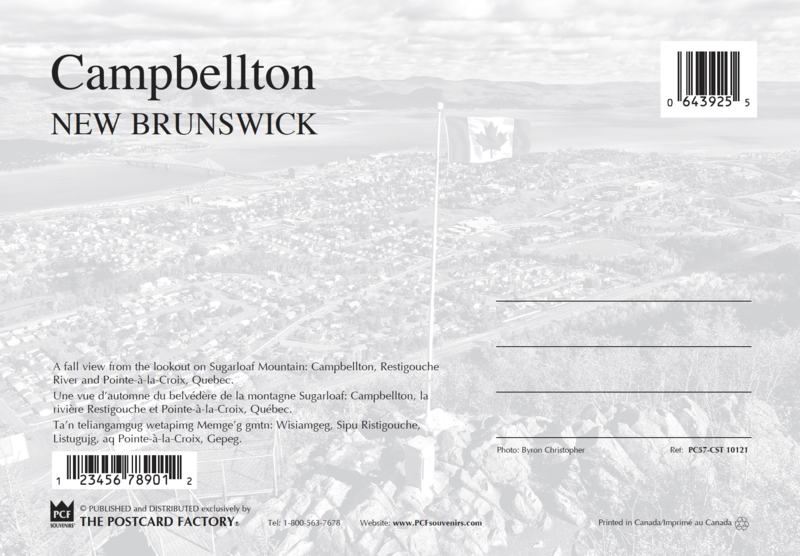 Hopefully, the new postcards of Campbellton will fill in some potholes on his long road to recovery. Chris today with his mother, Barb Snow, and dad, Len Snow. Lower left: his wife, Brigitte Dugay. Photo taken on 24 June 2018 in Flatlands, New Brunswick. Recognize that name? I certainly do. Rupert Lutes was the father of two boys I ran with when I lived in Campbellton, back in the 1950s and 60s. He was a Supervisor of Maintenance at CN Rail. Rupert, who retired in the 1970s, wasn’t one to spend his retirement years in a rocking chair. He bought golf clubs and made quite a name for himself at the local golf course, snagging the occasional hole-in-one and racking up some unbelievable scores. Rupert scored another hole in one when he purchased a ‘top-of-the-line’ Minolta 35 mm camera and a pile of lenses. He began to take beautiful photographs of his hometown. The idea of producing new, 4″ x 6″ postcards came after he visited two local drug stores and seeing what they had for sale. Well. Their postcards showed vehicles from the 1950s. It was time for some new stuff. Rupert Lutes threw his heart and soul into the project and he did this on his own time — and on his dime. The man didn’t need the money [he was drawing a good pension] … but he wanted to promote the town he loved. He didn’t have to travel to Australia to realize the beauty of Campbellton. Far as I could tell, Rupert pulled it off without any government handouts or committee meetings. When it came to postcards, a former railway worker promoted Campbellton far better than the tourism folk in Fredericton, the provincial capital. There was a bit of Charlie Van Horne in Rupert Lutes. He was straight-ahead and got the job done. After Rupert died, 22-years ago, his widow, Joyce Lutes, continued to deliver his postcards to outlets — and the woman did this when she was well into her 80s. Rupert Lutes’ postcards are still on sale at outlets such as Dixie Lee on Water Street. They sell for 75 cents. Thank you to Jeannette Thibeault and Melanie Nazair for the French translation. Hats off to John Van Horne for suggesting the Mi’Kmaq language should be included — and for former mayor Mark Ramsay and current mayor Stephanie Anglehart Paulin for giving the idea a thumbs up. A tip of the hat to Joe Wilmot at Listuguj who kindly translated the cards to Mi’Kmaq — and to local nature photographer Darlene Firth [Dawonsville] and to Donna Lexi [Listuguj] for their help in paving the way for the Mi’Kmaq translation to appear on the cards. Without their help, this would not have happened. Thanks also to John, Rose, and Hermini for their help on the days the Phantom took to the skies to capture those beautiful images. It’s always nice to have reliable co-pilots to warn of overhead wires and tree branches. Finally, a huge thank you to all those who’ve treated me so well whenever I have returned to Campbellton for a visit. And a special heart-warming thanks to Don Hume, a walk-the-talk Christian, a tremendous example of community-mindedness. Class and love are the greatest gifts. Call it payback. The postcards are my way of saying ‘thank you.’ I hope they succeed in promoting my old home. I can’t say enough about those who work at the Markham, Ontario company that produced the cards, The Postcard Factory. I dealt with perhaps half a dozen people there … a sales rep, sales/marketing manager, receptionist, layout staff, communications staff, and somebody in accounting. May have even talked to a night watchman, not sure. ALL were a 15 out of 10. They took my phone calls and for those times when I had to leave a message, they promptly returned those calls. The staff responded to my emails promptly and communicated clearly. The Postcard Factory is a class act from start to finish. Management could give classes to private and public sector employees on how to get the job done. To top it off, the company chose a courier [FedEx] that delivered the postcards in good condition. And on time. Why not? I can see more postcards coming down the pike, just as Campbelltonians can see an end to snowstorms in May. Okay, June then. Salmon Festival organizers are now thinking about manufacturing their own postcards [good idea], as is Brent Babcock of the Restigouche River Experience Centre. Another good idea. The postcards should sell well … and promote the city even further. Campbellton City Hall [506.789.2700] should have more information on when this will happen. I can see historical cards being produced plus postcards depicting local animals and birds. 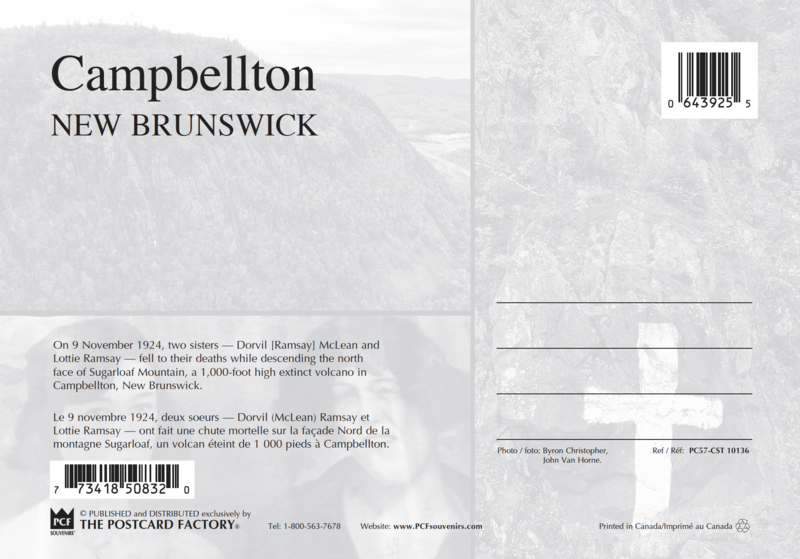 I can also see the day when little ‘ol Campbellton will have more local postcards than places like Moncton and Halifax. This post mentions people and subject matter that’s covered more extensively in these stories … Click away. Great job, as usual. Thanks for promoting Campbellton. Beautiful postcards. I will definitely be buying a set. I have downloaded some of the pictures. Childhood memories and return visits are always precious. The quality of these images is stunning. The clarity, the colours, the point of view all combine to make true picture postcard images! A professional charging thousands of dollars could not do better. I thought postcards were fading away like old memories. You’ve found a way to breathe new life into the concept. Even if postcards aren’t in every town’s future, images this good should be available for download on their visitor centre or community websites. I hope these postcards are seen by people who can open doors for you to refresh the images of other communities. Happy journey! 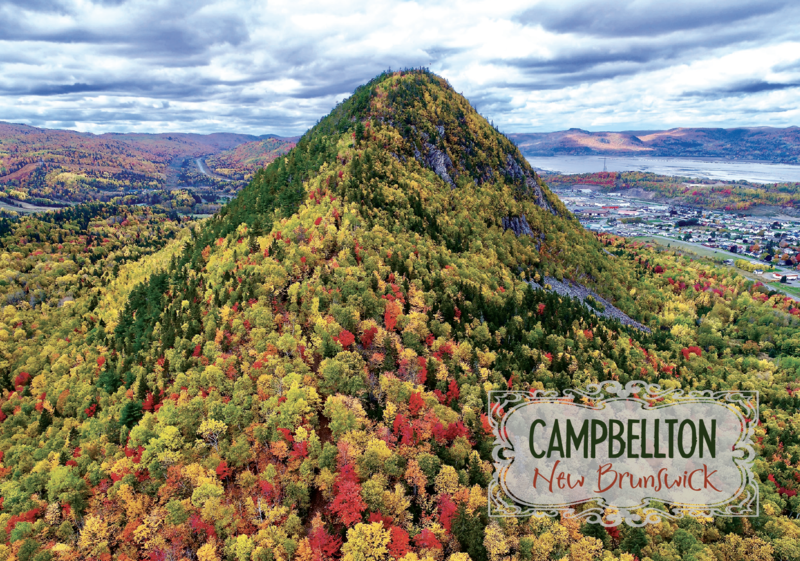 These new postcards are a stunningly beautiful photographic tribute to Campbellton. You have seen a need and fulfilled it admirably, and with great professionalism. Wow! Absolutely stunning photos, a great idea. We surely live in God’s country! Good job. I tip my hat to you again … hope you drop in for a visit this summer. You know where to find us. Well done. The pictures are gorgeous and definitely will be big sellers. You are one special guy. Loved reading your stories and thanks for taking me for a walk down memory lane. These photos are marvelous. Taking a few moments to reflect on our childhood days when these familiar landmarks we mostly took for granted but magnify their beauty after decades away from Campbellton. Wonderful post cards. Great job. I loved growing up in Campbelltin. After moving back to N.B. I will be making lots of trips there. GREAT after all these years! They convey the natural beauty of the region we Campbelltonians have always known. Also, I was happy to hear that some of the procedes from their sale would be donated to help Chris Snow’s recuperation. We had a great childhood growing up in Campbellton, there was so much to do, brings back lots of good memories. I am so impressed by these postcards. They brought back so many memories from living there in the 1950’s and early 60’s. Been on that bridge many times as a kid and was always a great memory. Great booster piece, Byron. Your love for your old home town glows in this piece as well as past ones where Campbellton appears. Bon chance avec les vendres! Ann-Marie, my wife of 50 years was a “come from away” [southern New Brunswick-Quispamsis] when we married and took up residency in Campbellton for the next 25 years. She shared your appreciation of the beauty of the Campbellton area and would often remark “God made it so beautiful … but why did he put it so far away!!! That says it all. It’s easy to fall in love with Campbellton. Congratulations for taking up the challenge. Most people figure promoting postcards is swimming upstream in today’s media environment. I like your step-by-step boiler-plate business plan for those interested in marketing the new cards. And the beneficiary plan for profits — inspiring! There may also be an income tax deduction for many of the charitable dollars handed out. A lot of work went into this enterprise idea. It could serve as a template for other picturesque and beloved hometowns. Thank you and all collaborators on this … your article hits “Love of Home” buttons in my heart, as always. Thanks for the history lesson as well, and for promoting our community. Really good initiative … and you are right; we can never repay what we learned during our years as kids in Campbellton. Three things stand out: intelligence (the ability we all seemed to have to adapt), energy (we all seemed to have that, too!) and integrity (which was demonstrated at home, taught at school and expected in the community). And without integrity, the other two are a liability. My husband and I love the postcards — and what a great idea of putting information on the back in three languages. Campbellton is lucky to have you as an ambassador to showcase our little corner of the world. It is one of the Creator’s most beautiful places. We were all lucky to come from there. Home is Downeast and always will be. To this day, I still consider Campbellton my home and always wished to move back. As I get older, I really miss home. I’m probably not the only one who thinks that way. Those were great childhood days, living in Campbellton. When we go home, driving through the Matapedia Valley, that’s where we roll down the window, take a deep breath of the fresh air [not polluted], and listen to the sound of the river, so quiet — and the breath-taking the scenery! Love that drive to Campbellton … then seeing the Sugarloaf come into view! We are home! I hope to be able to do the trip again this summer. It’s been three years since we’ve been away. I really miss it. I’m now 71. Byron, I’m happy that I found you to bring back those memories in our lives, thank you again. 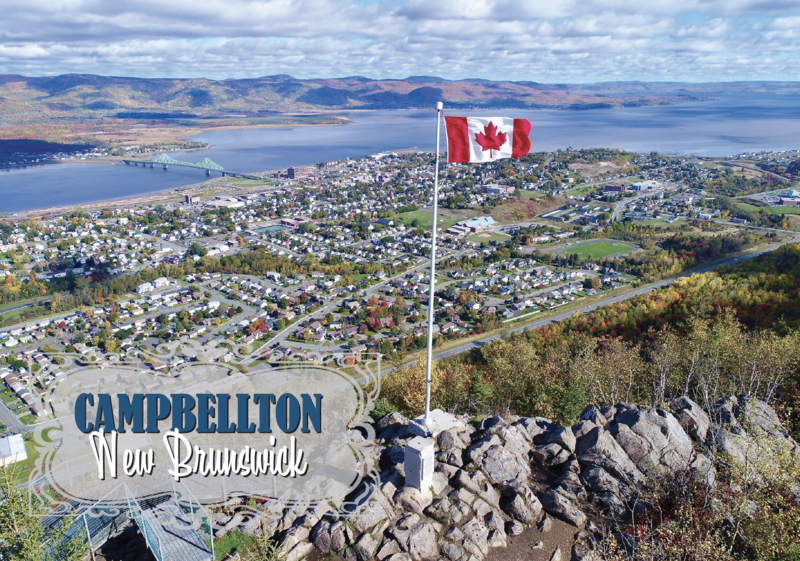 Many of us have moved away, but home is always Campbellton. You bring us all back through your photos and stories. We would like to sell the postcards in our restaurant in Tide Head [Sanfar]. How would we go about this? You’ve given ‘life’ to Campbellton, a place I’ve never been to. I had seen Campbellton and the Restigouche River on a map but had no idea how beautiful the area is. The aerial photographs did it. I knew about the Restigouche because I’d been along Canada’s eastern coast on ships [as a merchant seaman]. Now, you’ve given it life. I also enjoyed your story of the girls who fell off the cliff. And I can name the beautiful bridge — the Van Horne Bridge! Thank you.